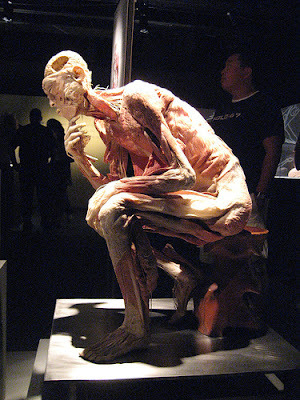 Last Sunday, Sinéad, Jen and I went to see the BODIES exhibition in Dublin's Ambassador Theatre. Opening weekend as it was, the place was packed, the queue for tickets long and the experience rushed. Given that, I came away with some learnings. If possible pre-book your tickets online. Again, it was opening weekend so crowds were probably higher, but the difference between the queue outside at 2pm and 2.15pm was actually a good twenty people. However, those with prebooked tickets can just walk right in. We braved the queue and bought our tickets for a later time so could do the same. To give you an example, below is the queue outside on Sunday at 2pm, before they put up the barriers and formed multiple lines just an hour later. Neither are allowed in. I was quite disappointed about the camera rule, given that photos could serve to only pique curiosity rather than repulse most people, but there you go. There is a free cloakroom where you can deposit your stuff. If it's busy, I'd recommend putting your coat in as well - it gets warm! On a side note, I'd forgotten notebook and pen so scrawled down my impressions on the back of postcards with a borrowed biro. Therefore the below may be subject to inaccuracies as I try to decipher my almost illegible scribbles. Why all this interest in the human body? The answer to this question seems quite clear to me. Your body is the one thing that you carry with you from the moment you are born until your very last breath. Dr. Roy Glover is "Professor Emeritus of Anatomy and Cell Biology at the University of Michigan and the chief medical director of the University of Michigan Medical School Polymer Preservation Laboratory. 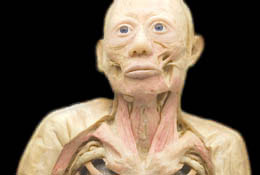 He serves as Chief Medical Advisor and spokesman for BODIES... the exhibition". That's according to Google anyway. In the various articles I've researched, a couple of things come up - how were the bodies acquired, what was done to them and if it's ethical. "How were the specimens on display in our exhibition obtained and prepared? All of the bodies and organs came from individuals who chose to donate their bodies to medical science for the purpose of study and education." '... dogged by controversy with suggestions that the exhibits were either executed Chinese prisoners or were people who had not given their consent to have their bodies shown after their death. Dr Glover said: “We have practiced due diligence in obtaining the bodies. We work with a partner that we have the utmost amount of trust in – the Dalian Plastination Facility in Dalian, China. “The person I work with it is a personal friend of mine. We have been in the same professional organisations for many years. He has sworn affidavits to the effect that the bodies were those who have died of natural causes. All of the bodies were obtained through a credited medical university in the People's Republic of China. Asia possesses the largest and most highly competent group of dissectors in the world, and they are highly skilled in preparing the bodies for educational and scientific purposes. Currently, human specimens in medical schools in China, the United States and other countries throughout the world are donated or unidentified bodies. Roy Glover, spokesman for BODIES... 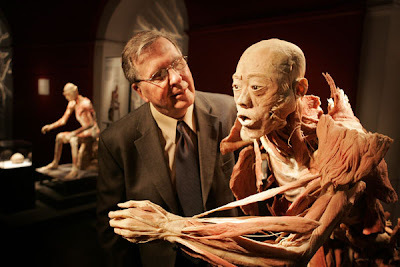 The Exhibition, says its cadavers -- all from China -- did not come from willing donors. "They're unclaimed," Glover says. "We don't hide from it, we address it right up front." So there you have it. They are bodies from China that may or may not have been willing participants in the project. Does that matter? Does it make a difference to your knowledge of the exhibition once inside? For me, not really, because far from being the 'ghoulish' and 'gruesome' spectacle the ever-reliably tabloid Indo claims it to be, the bodies are displayed in a museum or gallery exhibit format. There's not much to be squeamish about and the Polymer Preservation process involved was by far much more of interest to me. ROOM ONE: Entering the exhibition. You walk down a hallway and into a big room with a lot of glass cases and "models" on display, and, in my case, a lot of people. I'm not a crowd person so before I joined the fray I spent a bit of time just observing. Though not of the Dublin exhibtion, of which there are few photos that I can find, the below should give you an indication. On the walls around the exhibition are signs and projections. They both feed back into the educative theme behind the exhibition, telling you things like 'Compact bone tissue carries your weight' or how the projections are artists impressions of the cells and tissues in your body. 'More than 200 different kinds of cell and 75 trillion cells in total make up the body'; 'Fibroblast cells build and maintain cartilage, skin and bone' and so on. 'The study of human anatomy has always operated on to see is to know. This Dara Mac Dónaill/Irish Times photo of Dr Glover with one of the specimens should give you an idea of what you'll be seeing, far better than those on the website. They are as they're advertised - bodies without the skin, but showing everything (minus the blood) that's beneath. One model shows muscle attachment and layering, showing the four muscle layers separated from their points of origin but connected to the points of insertion. One case held the muscles of the arm and leg, giving you the opportunity to see both limbs up close. You can walk around most of the full figures. The one above (adapted from an Irish Times photo) shows a male figure, metal filling still in teeth, which purports to "illustrate the nearly countless number of tasks the brain executes from basic to highly complex actions". Another fascinating exhibit was the seated figure with an exposed brain. The meningus gyrus and grey matter were apparently prominently visible, but the poignancy of the piece overlooking a case containing disected brains was quite something. Again, each part in the case was labelled clearly and familiar parts from crime novels or CSI episodes became much more than "somewhere in the head". Room two was dedicated to blood - the vessels, the muscles, the arteries and valves. 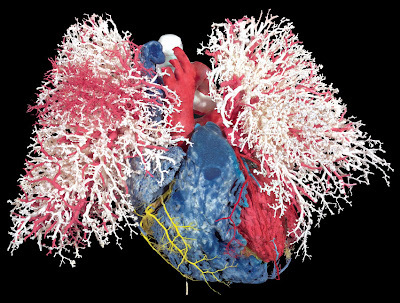 Special dissections revealed blood vessels and specimens like the heart with coronal cut, the arteries of the kidneys and those of the stomach and thorax are, pardon the pun, very illuminating. "Using a technique called corrosion casting, the blood vessels were first injected with a coloured polymer which hardened, The remaining body tissue was then chemically removed, revealing the delicate matrix that transports the blood." The full body blood vessel map of a male body has to be seen to be believed. "On average a pack of cigarettes shaves 3 hours and 40 minutes off your life. Leave your cigarettes in this gallery and stop smoking now". Smokers beware - this is not a good room for you. 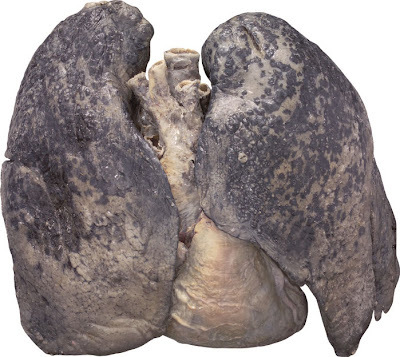 Given that the first specimen in this example of smoker's lungs (I didn't embed it because it's quite gruesome), while it may not put many smokers off the habit, it's certainly a warning for the rest of us not to start, especially when compared to the model of the healthy lungs. 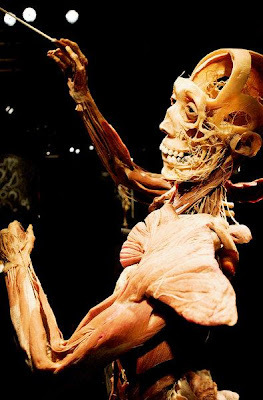 This room also went into the digestive functions, with a body displaying how the whole viscera, the vital organs of respiration, digestion, circulation and reproduction are all contained within the thoracic, abdominal and pelvic cavities. There is also a specimen showing the distribution of fat on an overweight female, sectioned as she is, vertically, into four or five pieces. I learned a couple of interesting facts in this room. One, that the sperm is the smallest cell, the female egg is the largest. Two, that the phrase "miracle of life" is indeed very apt and three that foetal development is an astounding process. On one side of this small room, we see foetal bone development at 11, 13, 15 and 16 weeks due to a process involving Alizarin, a dye which binds to calcium to measure the stages of skeletal development. In others we get cross sections of foetuses in various stages. I came out from there ready now to go, as awe inspiring as I found that particular section. On the steps outside was a young fella, possibly around 13 or 14 in floods of tears for some reason. The last room was much bigger and contained interesting specimens of bodies in cross section, diseased or cancerous parts of the body and so on. I didn't linger though, I just popped into the very pricey gift shop (t-shirts €22, keyrings €5) and then headed out. 'We live in a world surrounded by technology, information and cement; fast paced living with little time for reflection. When an illness is severe and our mortality comes into question, we may take this time to stop and ponder our existence. But cured, we are off again, not thinking about the extraordinary, complicated human beings we are. Our bodies are indeed intricately more complex than all the computers and gadgetry that surrounds us today. Yet many of us do not really know what lies beneath our skins, how our bodies function, what they need to survive , what destroys them, revives them. 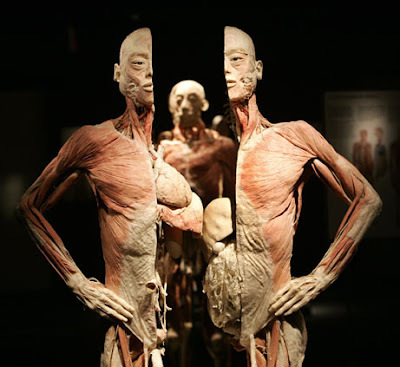 BODIES... the exhibition is an attempt to remedy this unfortunate set of circumstances. Take the knowledge gained from this exhibition, expand on it and use it to become an informed participant in your own healthcare. This involves more than improving your diet or beginning a long overdue exercise program. Taking all that into account, BODIES... The Exhibition is well worth seeing. The price is hefty at €20 and repeat visitors should be offered half price tickets. I think too there should also be "quiet hours", where, once the initial rush has died down, the organisers offer to let only a set amount of people in to see the exhibition and to take their time. Given it's booked for six months, this may become a reality. You'll need to take one, maybe two hours to properly see the entire exhibition. We entered at 3pm and were out by 4.05pm but that was more due to the crowds and the heat. It sparked interesting conversation, but ultimately each of our experiences were personal, were unique and we all saw things the others didn't. Would I recommend it? Yes, definitely. It left me with a high regard both for the human body and the healthcare professionals who deal with it. Reading all the recent articles regarding how right it is, the rights of those whose bodies are being used, of their families, the sourcing of the bodies and indeed the promotion of the show as an educational rather than a commercial experience, I still feel a sense of awe for the process, the intricacies involved, importantly the science behind it and most importantly the delicate but fascinating chance to see what's under the skin, in a human body, up close. Steph has her review here while Aonghus recommends not getting the audio guides as they have the same information as the display cards. The exhibition is open 10AM to 8PM Sunday to Thursday and 10AM to 10PM Friday and Saturday. You'll find more information on the website here. All photos in this post are sourced from here and here unless otherwise stated. And I'm amazed at how much you absorbed considering the crowds when you were there. I hit lucky by visiting mid-week 4.30-6pm when it was fairly quiet. "become an informed participant in your own healthcare. This involves more than improving your diet or beginning a long overdue exercise program. It involves partnering with your doctor to understand what you - and your unique body - need to sustain a full and rewarding life." we love it,little halle who is 4 was amazed and said it was a bit weird but would go again. Been meaning to read this for yonks, you sure do pack a punch when you review! I think it's so exciting and necessary to see science and culture combine this way because it's enlightening people, and as you outlined above, encouraging proper involvement with our machines. Really shouldn't be left to a travelling fair though, this is the kind of display we need full-time in museums. Steph: Thank you. The crowd thing was an issue so I probably didn't get to look at or see as much as I wanted to but I think the sense of the place is summarised quite well in the sign at the end. I agree that it should be a lot more common place! Anonymous: Great to hear! I'd love to watch a child's reaction as they realise that what they're seeing in front of them is what's inside of them. Nay: Sure all I can do is try. It would be amazing to have this as a permanent exhibition. It's not at all the same thing to this, but I really miss the Natural History Museum. Hope you enjoy it as much as I did! Ugh, that pic of the smoker's lungs. just ... ugh. Hmm ... I wonder what colour mine are? This is a brilliant post, dude. I've forwarded it to a few nursey friends of mine, there's pretty much everything here that I wanted to know! I'm itching to see this, it's so intriguing. Has anyone been to the exhibition recently... are the queues long? am going to bring some children from my class into see it and not sure whether to book the tickets or get them at the door. ahhh going tommorrow with my school.. dont want 2 go now! great insight you gave there.. maybe to good.. the lungs look really freaky!! !